Growing tender, glossy eggplant (Solanum melongena) in the vegetable garden requires a little fertilizer, plenty of heat and sun and good soil, but the most important element is how you water. Infrequent or inadequate watering makes the harvest tough and spongy -- a real disappointment. Though a tender perennial hardy in U.S. Department of Agriculture plant hardiness zones 9 through 12, eggplants are commonly grown as warm-season annuals. Three eggplants growing in a garden. Growing eggplant requires lots of sun, at least six hours per day, but more when possible. Pick a growing spot that has loamy garden soil that drains well. Eggplant doesn't grow well in heavy clay soil or soggy areas. 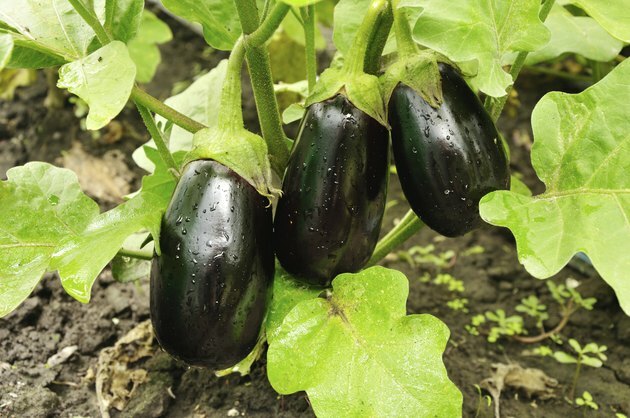 Whenever possible, grow eggplant in a raised bed filled with high quality garden soil or topsoil. The raised beds get warmer faster in the spring, giving eggplants the heat they need to produce a full crop by the end of the summer. If you have room, space eggplant 30 to 36 inches apart in rows 30 to 36 inches apart. If spacing is tight, you can grow the plants 18 to 24 inches apart. In small gardens where you're growing just a few plants, staggering plants rather than creating formal rows works well. Eggplant needs between 1 and 2 inches of water per week -- from rain, manual watering or both -- to grow well and produce a tender crop. The 1 to 2 inches of water will wet the soil 5 to 6 inches deep. Water slowly once a week so the water seeps deep into the soil rather than watering lightly more frequently. If you're growing eggplant during the winter as a perennial, set a rain gauge in the garden and add supplemental water if it registers less than 1 to 2 inches per week. Once you see the first mini eggplants starting to develop, it's time for a fertilizer boost. Use a general-purpose fertilizer like a 5-10-5 or a 10-6-4 formula. Sprinkle 1 level tablespoon onto the soil around the base of each plant. Follow up with a thorough soaking with about 1 inch of water. Avoid overwatering by combining one weekly watering with the fertilizer application. This single fertilizer application gives plants grown as annuals as well as those you are growing as perennials the nutrients they need to produce a strong crop. In late spring, once the soil warms up to 75 degrees Fahrenheit or above, spread mulch 2 to 4 inches deep over the soil. Use an organic mulch like clean grass clippings or seed-free straw. Spread the mulch evenly but leave 1 to 2 inches of space between it and the stalks so excess moisture doesn't cause rot problems. Mulching does two things: it slows weed seed germination and it slows water evaporation. Pull any weeds that make it through the mulch by hand. Dwarf eggplant varieties can stand on their own, but plants that grow taller than 24 inches -- eggplant generally grows between 2 and 4 feet tall -- need support. Use a 2-inch-diameter stake that is between 5 and 6 feet tall. Drive it 12 inches deep into the soil -- a sledgehammer works well for this task -- about 6 inches from the base of the eggplant. Ideally, insert the stakes at planting. As the eggplant grows, loosely tie the main stem to the stake with garden twine.